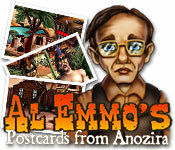 Al Emmo's Postcards from Anozira is rated 3.1 out of 5 by 9. Rated 5 out of 5 by saraclancy from Great game. Enjoyed very much, a nice challenge, not for kids as its kind of difficult. Played over & over to get a higher score Loved it. Rated 5 out of 5 by bat_thomas1 from What a Challenge This game has a lot of negative reviews so I had to add my thoughts. The game is not easy, objects are sometimes hard to find. But that is the object of a HOG. If the items are easy to find, it gets boring. I am now going to look for low reviews, this game is super great. Rated 4 out of 5 by arnold1049 from ARIZONA SPELLED DIFFERENTLY I liked this game and found it harder in places than it looks like it would be on the surface. It does get monotonous as the format is the same throughout the game; HOS then fairly easy mini puzzles of about only 3 or 4 types; straight puzzle, rotate and move puzzle, find the differences and moving pieces about with one blank space to reproduce the picture. The last type of puzzle was the hardest for me. The game can be played either timed or not. I played it timed and had to use several tokens (see below) to finish the HOS. If you run out of time, on the puzzles, you have to start over. I never ran out of time on a HOS (I used a skip token instead) so I don't know what happens if you run out of time there. The "story" behind the game is that a group of 5 people are trying to figure out ways to increase tourism to Anozira. Everyone is told to go through the town and come back with ideas. You have to pick a character to use in order to play the game. I haven't tried it yet, but I think I could go back and play 4 more games using the other characters. The HOS certainly contained enough items to support that and never duplicate a single item. This is also where the game was a little hard, the HOS. Some items are extremely small and others are very well hidden in the background. As you play the scenes, you must find tokens that give you extra points, allow you a hint or add time to the clock. If you use all your token hints, you can't get anymore in that HOS; you must finish or skip that one and go to another to collect the tokens. There is some time penalty for erroneous clicks but you are allowed several before the penalty kicks in. At the beginning of the game, I had no problem collecting the maximum number of hints and time tokens and having them in reserve. But towards the end of the game, either because it got harder or I got tired, I found that at times I came very close to using all my tokens for one HOS. I enjoyed the graphics; they were sharp and bright and made me think of a perfect town. I played without sound, except for the voiceovers. I chose the Mayor as my character and his voiceover was right on. The Mayor produces postcards for each location he visits with a few facts about the location. This is his contribution to the tourism project. I wonder if the other characters will come up with the same idea. There were 29 locations for HOS, so if you don't like a lot of HOS, this game is not for you. And the fact that the mini puzzles weren't that hard and were repetitious may make you think twice about getting this game. I recommend getting it on sale or using a coupon because I think it is a good game and a nice relaxing way to get away from the dark, convoluted CE games out there. P.S. Did you figure out that Al Emmo's name, when said quickly, is Alamo? Cute play on words throughout the game that added to my enjoyment. Rated 4 out of 5 by Hookedonbigfish from Just like any good Western The mayor of Anozira and a co-opted group of towns folk are committed to restoring tourism to this little western town and whilst in the process of travelling around collecting a series of postcards along the way. A nominated person from the above group describes various aspects of the town as he collects the post cards. There is not much dioalogue other than this. The background music is quite catchy. The graphics are clear, precise and colourful but having said this, a good number of the hidden objects are very difficult to locate and a hint is needed. You are given 5 hints and you can build up more hints (up to 5) by finding hint tokens in each scene during the game. You can also find time tokens for adding more time and also skip tokens. The is also a fast find bonus. The puzzles and mini games are basically jig saw puzzles games, moving and rotating pieces and shuffle puzzles plus others. I found it to be quite an enjoyable and entertaining game. Rated 3 out of 5 by pennmom36 from This Is Not How The West Was Won! I try to find something good in all the games I play and review, so this is it in a nutshell. You get to choose from 5 different characters as your avatar, anything from the Mayor to the bartender and each character comes with a brief description. Each level has a timer, there are hidden tokens in each scene not listed, some are extra time, some extra points, as well as extra hints. You collect 29 postcards which allows you to travel to different destinations, so I'm guessing there are only 29 hidden object scenes total. After each HOS there are simple puzzles to complete such as jigsaw and sliding puzzles. The problem with this game is that the hidden objects are out of proportion either too small or too large, the items are spewn about the scene and they aren't even items that would have been around in that time period. This game has a good concept but poor delivery. Rated 2 out of 5 by campingramps from They fell short on this one Can we say annoying characters? Who picked the voices for this group of people? Makes me shutter. This was not a really bad game just not a good game. This one is a little bit below average. Glad I played in relaxed mode 'cause never would have made it in timed. HO's were a little difficult to find but not impossible and I didn't have to use ALL the hints just most of them. Good thing is on the next level, if you find Al Emmo's coins, you can get them back. Puzzles between levels are what caused my downfall. First one is a jigsaw which is fine because I love jigsaws. Second one, however, was one of those slide type and I am not a fan of those at all and that is where I quit. No skip button that I could see or I might still be playing. Graphics are ok but nothing to write home about and the music had to be turned down. All in all, I cannot recommend this one unless you like to be frustrated. But play the demo and decide for yourself. Have fun! Rated 2 out of 5 by BirdLover89 from No good! I got nowhere fast playing this. I'm glad it was just the demo. The HOs are mostly impossible to find. You only get a few hints. I hate a game that is mostly HOs and you only get a few hints and the objects are way too difficult to find. What are you supposed to do when you have no more hints and are stuck trying to find a HO? You uninstall it like I did. This game could have been cute and enjoyable if not for the above complaints. Rated 2 out of 5 by mrm2006 from Back when Arizona used to be Anozira. The story line is weak, at best. 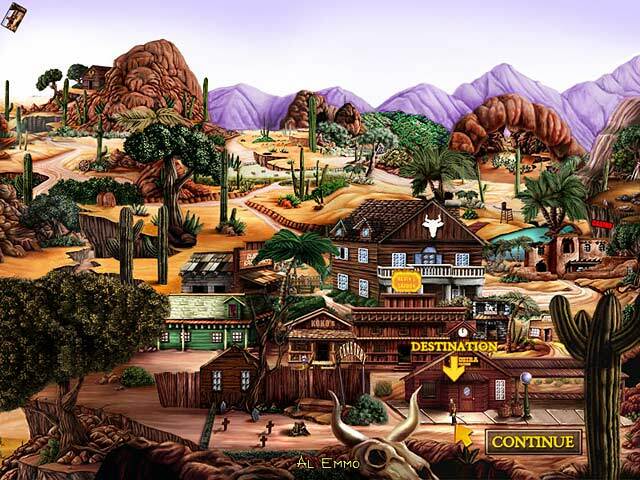 There are 5 characters who live in the town of Anozira (Arizona spelled backwards - that was just too easy to figure out). A Hispanic female and 4 men (Australian barkeeper, Mayor, an American Indian who sounded mentally impaired and a banker (?) who used too much helium as a child). The female didn't even have an accent to begin with. They decide they want to bring tourism (basically) to their town and build it up so off they go to the four corners sending postcards back to town describing what they've seen or done. There are 29 postcards to collect (obviously, 1 for each stop you make on the map) to "win" the game. It's an HOG .... how can you lose an HOG? The hidden object scenes are a joke. Items are so small or immensely huge AND mis-named. For instance, a "cone" is a traffic cone but could also be a pine cone. And these items are in a mish mash of what looks like hundreds of other items. They can't be found. The mini games are childish, at best. Jigsaw puzzles (13 pieces? ), etc. There is a hint button but you are relegated to only 4 hints. You can earn more hints by finding coins in the HOGs. These coins not only earn you hints but can "help you in an assortment of ways". I detest games where you have to earn hints. Now, the ONLY good thing about the game. Hence, the 2nd star. The graphics. For a cartoon game, the graphics are AMAZING! Lip-syncing! And take a goooood long look in the HOGs because there is stuff HAPPENING! Bar girls leaning over the railing upstairs looking down at the cowboys drinking and talking below and more!!!! You don't even get that in the BEST of games today by the BEST of devs. If only the rest of the game was in par with the graphics I would have jumped at the chance to buy it. Alas, for all the reasons stated above, this game is not a purchase for me. And the ONLY reason I am recommending it is so everyone can watch the amazing graphics come to life in the HOGs.